Need an airport transfer in the Las Vegas area? Forget the long lines associated with finding transportation to or from the many McCarran International Airport arrivals and departures. Skip the taxis and shuttles and travel with confidence by scheduling for a shared vehicle. Climb aboard a 7- or 11-passenger van, then sit back and relax on the road to or from the airport and any of the hotels or resorts on the Las Vegas Strip or downtown Las Vegas. Cheaper than a taxi. We would have used the hotel pick up and drop off. The pick up would have worked, but the last time the hotel dropped off was 3pm. They must not think anyone plans on taking a late flight. After comingout of airport we made our way to where the SuperShuttle van was standing. Was told in no uncertain terms by the driver that he didn't recognise my voucher and to go over there and get it sorted. I saw the booth he was talking about some distance away on the opposite side of the road and made my way there. After much queuing the assistant said that, although I had booked a trip to the hotel and a trip back from the hotel to the airport on a different date, SuperShuttle had in fact booked me two trips from Vegas airport to the hotel and no return. She took ages trying to resolve the problem and, in the end, cancelled my bookings and had to rebook them. Eventually I was able to return to my husband to wait for transport to our hotel. Again, we waited and waited and waited and almost gave up. Once it came we arrived at our hotel after a few drop offs. Travel between airport to hotel - round trip. Good bang for your buck. Easy to use and inexpensive. Would recommend. Since this was our first visit to Vegas, it was reassuring to have our ride all set from the airport to our resort since our resort did not offer shuttle service. Having the guidance of where to find the Supershuttle in the Las Vegas huge airport was comforting, The staff us very efficient and accommodating. 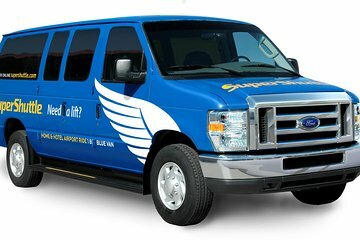 It appeared that you don't always need reservations to use this Supershuttle service, but when our plane arrived late it was comforting to know they were there to get us to our resort late at night. When we arrived in Las Vegas, we had to wait one hour and fifteen minutes because the shuttles were full and we had to wait for one to come back. It was freezing cold and we were treated with indifference. I don't know what the point of booking this transfer ahead had because it made no difference. I would never do this again preferring to take an UBER. It is not worth the stress and inconvenience. Excellent shuttle service, great drivers, highly recommend, punctual. Landed at airport at 11.30 pm I actually thought because I'd pre booked the transfer it would have been quicker but alas no had to wait 30 mins. Got picked up exactly on time to go home though.drivers were happy and good.but for the price of the transfer I suppose I shouldn't moan. Would definitely use this service again great value for money helpful staff door to door and help with luggage great service.